Source: CICH graphic created using data adapted from Statistics Canada, Canadian Vital Statistics, Birth Database, Table 102-4503 Live births, by age of mother, Canada, provinces and territories, annual. http://www5.statcan.gc.ca/cansim/a26?lang=eng&retrLang=eng&id=1024503&&pattern=&stByVal=1&p1=1&p2=38&tabMode=dataTable&csid= -accessed March 15, 2017. In 2013 there were 380,323 babies born in Canada. 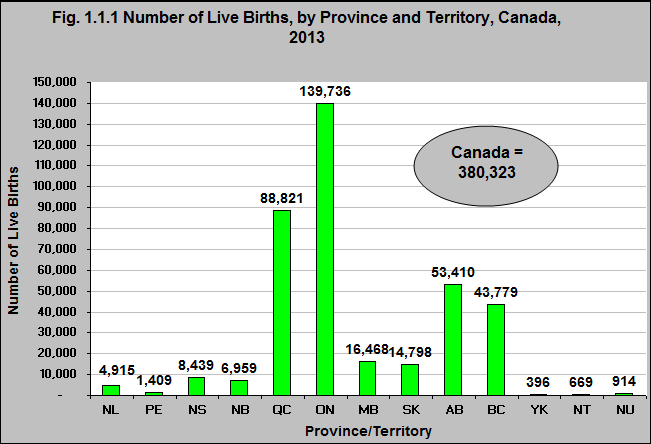 The largest number of live births were in Ontario (139,736) making up 36.7% of all live births in Canada. 1Statistics Canada, Canadian Vital Statistics, Birth Database, Table 102-4503. Live births, by age of mother, Canada, provinces and territories, annual. http://www5.statcan.gc.ca/cansim/a26?lang=eng&retrLang=eng&id=1024503&&pattern=&stByVal=1&p1=1&p2=-1&tabMode=dataTable&csid=-accessed March 15th, 2017.